The triple burden of malnutrition is causing very serious human misery to many millions of individuals and the economic and health costs to societies are high. Agricultural research and policy can be an important part of the solution but it can also be part of the problem. The key is to design policies and research priorities to fit the particular circumstances rather than seeking policies that fit all. Incorporating nutrition goals into the decision-making process can make these policies more effective in solving the nutrition problems but the impact will be limited by other barriers to good nutrition such as contaminated water, poor health and sanitation, vested economic interests, and consumer behavior that may not prioritize good nutrition. With 5–10 million preschool children dying of hunger and malnutrition every year, with 800 million people suffering from hunger, with every third pre-school child in developing countries being either stunted or underweight or both, with almost one-third of the world population suffering from micronutrient deficiencies, and with the prevalence of overweight and obesity expanding at epidemic rates, already reaching about a billion people, it is time to act. Agriculture should do its part. 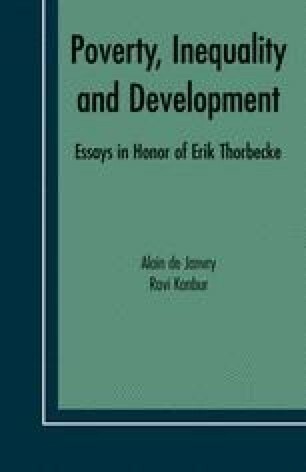 Paper prepared for “Poverty, Inequality and Development: A Conference in Honor of Erik Thorbecke, Cornell University, October 10–11, 2003. H.E.Babcock Professor of Food, Nutrition, and Public Policy, Cornell University and Professor of Development Economics, The Royal Veterinary and Agricultural University, Copenhagen.